Take a look at the casting calls below to see if one or many apply to you and your horse! Trailering ProblemsDoes your horse refuse to load in the trailer? Does your horse refuse to load in the trailer? Has trailer loading turned into a dangerous and scary experience? Help is here. Clinton is looking for horses and their owners to work with for a new series about teaching hoses to safely and willingly load in the trailer. If you and your horse are chosen, Clinton will train your horse and work with you one-on-one to get you and your horse back on track and enjoying your partnership. Critique MeAre you a NWC member wishing you could borrow just five minutes of Clinton’s time? Ever wish you could borrow just five minutes of Clinton’s time to tell you if you’re on the right track? Well, if you’re a club member and want to get tips from the best on how to improve your performance and become a better horseman (or want to show us how great you are! ), here’s your chance! We’re offering a rare opportunity to get critiqued in the Method from Clinton or Professional Clinician Shana Terry. Clinton and Shana will grade you doing a groundwork or riding exercise from the Fundamentals, Intermediate or Advanced level of the Method and offer constructive feedback. Selected members will be critiqued in the pages of the Journal or on club DVDs. You must be a member of the No Worries Club. Submit a video of you practicing ONE exercise from the Fundamentals, Intermediate or Advanced level of the Method. Your video should be a minimum of 5 minutes, but no longer than 10 minutes. The video must be live footage of you and your horse practicing an exercise – no photos or slideshows will be considered. ** Please note that not every submission will be selected nor will every submission receive a response. Inspire UsHave horses and the Method changed your life? Inspire us with your personal story of how your involvement with horses and the Method have changed your life. Are you a better leader? Did you find your personal strength? Are you confident and in control of your life? Are you a more compassionate, understanding person? Have you become a better parent, spouse, daughter or son? No matter your success story, we want to hear from you! Clinton and his production crew will even travel to your home for filming – at no cost. Please fill out the submission form, and in the “Tell Us Your Story” field, briefly describe how horses and the Method have changed your life. ConfidenceAre you searching for lost confidence? Horse ownership is meant to be fun – that’s why you decided to become a horse owner in the first place. But sometimes the passion we thought we were pursuing turns into frustration, or even worse, fear. Have you been in a serious horse-related accident that leaves you petrified to get in the saddle? Did you ride horses as a child, but have found as an adult your confidence is lacking? There’s no one better in the industry than Clinton at giving riders the confidence they need to safely and effectively work with their horses so they can start to enjoy a meaningful partnership with their horse. If you’ve lost your confidence with horses, we want to hear from you! Clinton and his production crew will even travel to your home for filming – at no cost. Please fill out the submission form, and in the “Tell Us Your Story” field, briefly describe your situation and what has caused you to lose your confidence. Last ResortIs your horse a threat to your life or to other horses? trouble crossing obstacles – water, logs, gullies, bridges, etc. spooky at objects – other animals, vehicles, etc. Horse PowerTell us how you use your horse in your everyday life. Are horses an integral part of your day-to-day life? We want to know how you use horses to make a living, serve others or make the world a better place. Do you operate an equine therapeutic riding center? Belong to a military organization that uses horses? Manage an equine law enforcement organization? If you use horses in your life, we want to hear your story! Clinton and his production crew will even travel to your home for filming – at no cost. Please fill out the submission form, and in the “Tell Us Your Story” field, briefly describe your situation or the organization you work with and why horses are important to your success. CompetitionHave you or do you want to use the Method to gain a competitive edge? Have you used the Method to successfully compete on your horse? Or, do you want to give yourself an edge in the competitive world? Clinton wants to either help you excel in the arena or hear how his method has helped you and your horse achieve your dreams. Clinton and his production crew will even travel to your home for filming – at no cost! Please fill out the submission form, and in the “Tell Us Your Story” field, briefly describe why you and your horse need help or the success you’ve earned in the competitive arena using the Method. Undesirable MatchDo you have the wrong horse? Has the relationship you imagined having with your horse turned into a complete nightmare? Are you afraid the two of you aren’t compatible? Clinton is an expert at matching people with horses and can offer a solution to your problem. Oftentimes, it’s just a matter of fine-tuning your communication with your horse and getting on the same page. Whether you are a first time horse owner that bought the wrong horse, or an experienced horseman that’s just not connecting with your current mount, share your story with us by submitting an application. Clinton and his production crew will even travel to your home for filming – at no cost. In the “Tell Us Your Story” field, briefly describe your situation and why you need Clinton’s help. Coping with Losses and ChallengesHave horses helped you cope with a loss or overcome life’s challenges? Winston Churchill’s quote “There’s something about the outside of a horse that’s good for the inside of a man,” is a relatable sentiment for all equestrians, but rings truer for some horsemen than others. When life’s challenges emerge, often times, there’s nothing more therapeutic than drawing on the strength and power of a special horse. If you’ve used horses in your life to cope with a loss or overcome a personal challenge, we want to hear your story! Clinton and his production crew will even travel to your home for filming – at no cost. In the “Tell Us Your Story” field, briefly describe how horses got you through a tough time in your life. Your StoryShare your story or problem with us. We’re always looking for inspirational stories or problem horses for Clinton to fix. If your situation doesn’t apply to any of the other categories listed, tell us your story or why you need Clinton’s help by filling out the form on the right. Clinton and his production crew will even travel to your home for filming! RelationshipsHave horses brought you and your family or friends together? Horses are amazing creatures that can take us on the journey of our lives, sometimes reconnecting us with those we love the most or helping us discover new friendships. If your passion for horses has brought you closer to your family or helped you discover new friends, we want to hear your story. Clinton and his production crew will even travel to your home for filming – at no cost. Fill out the submission form, and in the “Tell Us Your Story” field, briefly describe how your love of horses helped you develop new relationships or strengthened existing ones. BE A PART OF DOWNUNDER HORSEMANSHIPAPPLY TODAY! Please provide in the event you cannot be reached. Please place your YouTube video link here. (Minimum of 3 minutes in length of the horse in action. No photos or slideshows please. 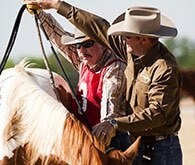 Have you attended a Downunder Horsemanship Clinic in Stephenville?